Even the ifs are big in Texas. The fast-casual category continues to grow, although not as fast as indie burger joints. For the year, fast casual showed a 6% increase. The number of quick-service restaurants of all menu types increased 2%. The beleaguered full-service category (encompassing casual dining, midscale/family dining and fine dining) saw a 1% unit decline. 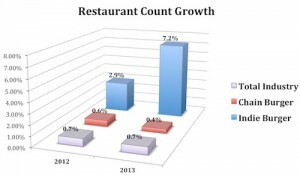 NPD conducts a census of restaurant outlets twice each year.